This is a group for singers from the Resist! event every THIRD MONDAY of the month at the Dubliner Pub & Cafe in St. Paul. Resist! 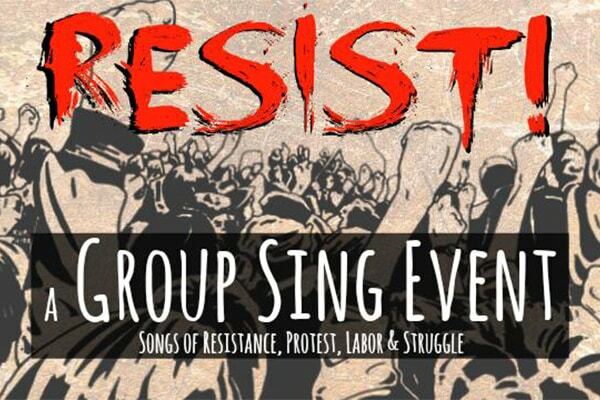 is a group singing event to share songs of Struggle, Protest, Labor and Resistance. Let’s share our best chorus songs of resistance, protest, Labor & Struggle. Old songs and new songs, from near and far, and encourage each other! Michael Sturm will coordinate, anybody/everybody can take a turn at leading. Bring a cheatsheet if you need it, but learning our songs by heart is best — then we’ll have them when we need them! Let us look outwards when we sing. Voices only, please. We’ll also be passing a hat to raise money for a small, local non-profit. Please make suggestions if you know of a good, progressive non-profit that could benefit from a small donation.